Weld RE-5J district officials are releasing more information surrounding a series of terminations in the district that have led to student walkouts in Johnstown and Milliken this week. 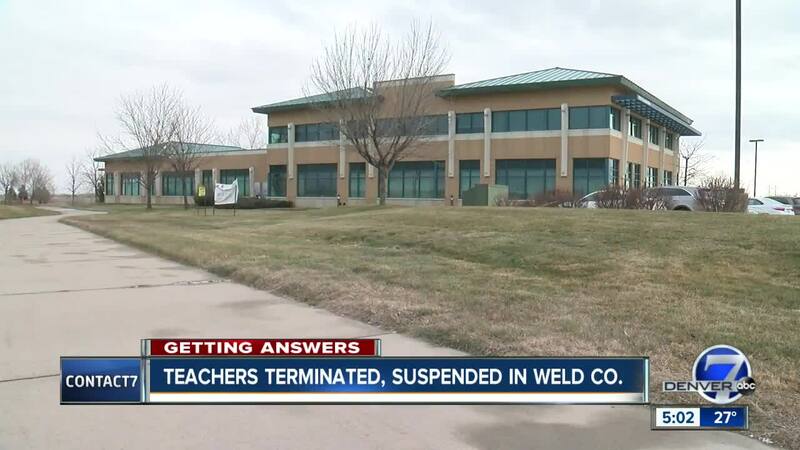 JOHNNSTOWN, Colo. — Weld RE-5J district officials are releasing more information surrounding a series of terminations in the district that have led to student walkouts in Johnstown and Milliken this week. Those “actions” include allegations of misconduct, intoxication, inappropriate interaction with students, and "deadly weapons" brought to school, according to the letter. The district said they are releasing this information in effort to be transparent and to dispel rumors circulating among students and staff. The following excerpt from the letter details the circumstances behind disciplinary action taken against five educators in the district. [REDACTED], Spanish teacher at Roosevelt High School - The termination of Mr. [REDACTED] was recommended to the Board of Education on September 19, 2018. This recommendation was based upon Mr. [REDACTED] history of engaging in inappropriate, unprofessional behavior with staff and students at Roosevelt High School, culminating in an inappropriate interaction with a student in front of an entire classroom on August 22, 2018. The Board is currently proceeding with this termination process. [REDACTED], Social Studies teacher at Roosevelt High School - The termination of Mr. [REDACTED] was recommended to the Board of Education on October 17, 2018. This termination was recommended after tests indicated he was intoxicated during the school day while on high school property, and a citation was issued to him by the Johnstown Police Department. Mr. [REDACTED] subsequently worked with the Superintendent and Director of Human Resources to develop a resignation agreement in an effort for Mr. [REDACTED] to move forward in a positive manner. [REDACTED], Language Arts teacher at Milliken Middle School - Mr. [REDACTED] has been on paid administrative leave since allegations were received regarding inappropriate social media interaction with a student. The Johnstown Police Department conducted an investigation, and our district has retained an independent investigator to conduct an investigation as well. Until the results of these investigations are finalized and the appropriate next steps are determined he will remain on administrative leave. [REDACTED], Music teacher at Milliken Elementary School - Ms. [REDACTED] was placed on paid administrative leave due to health concerns. While on paid administrative leave, it was discovered that she brought numerous deadly weapons to her classroom. No students were injured by these weapons, which were recovered by the Milliken Police Department. The police department investigation is ongoing. The district is in the process of completing its investigation and at that time will determine the appropriate next steps. Until then, Ms. [REDACTED] will remain on paid administrative leave. [REDACTED], PE teacher at Roosevelt High School - As we shared with RHS families earlier this week, Mr. [REDACTED] was placed on paid administrative leave pending an investigation into an incident that concerned the safety of a student who was medically restricted from any physical activity. This investigation was completed yesterday and he accepted a new teaching position at RHS as a social studies teacher. Mr. [REDACTED] has a teaching endorsement from the Colorado Department of Education in Social Studies which indicates he is highly qualified for the position, helps us fill the role left vacant by Mr. [REDACTED], and allows him to remain at RHS. To be clear, at no point was Mr. [REDACTED] terminated nor was termination ever proposed or discussed. He was on paid administrative leave while the district completed its investigation and an amicable resolution was reached. Student walkouts and multiple threats against schools in the district this week are believed to be in response to the action taken against the six teachers. Johnstown police said Thursday that they have arrested a juvenile female in connection to threats made to Roosevelt High School via the Safe2Tell network. Police were able to trace the IP address and make an arrest, according to a release from the Johnstown Police Department. The girl is facing a two charges of false report of an explosive device and interference with an educational institute. Police say the juvenile suspect confessed to making the false report. Police said that schools are safe and believe students are OK to attend class as normal.